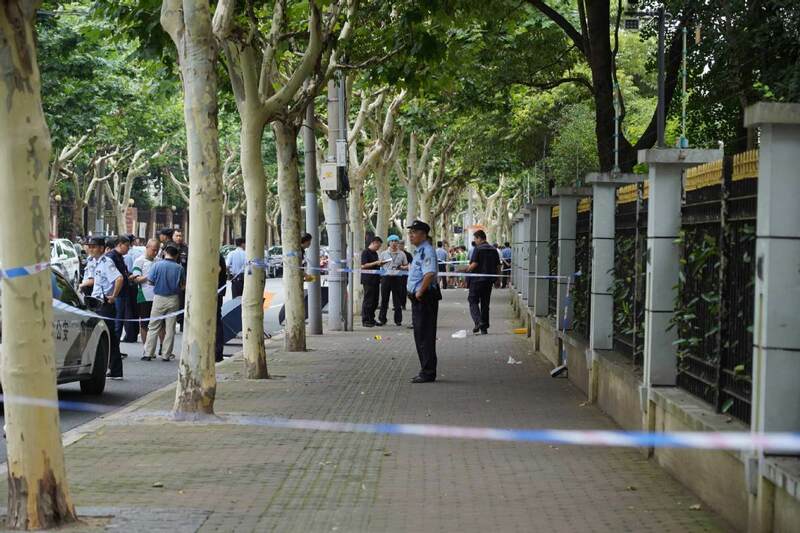 Police examine the site of a knife attack that occurred on Thursday morning in downtown Shanghai leaving two boys dead and another boy and a parent wounded. Prosecutors approved the formal arrest of the man suspected of stabbing two boys to death in Shanghai, while eight people have been summoned by police over online rumours about the crime and the assailant, authorities said over the weekend. 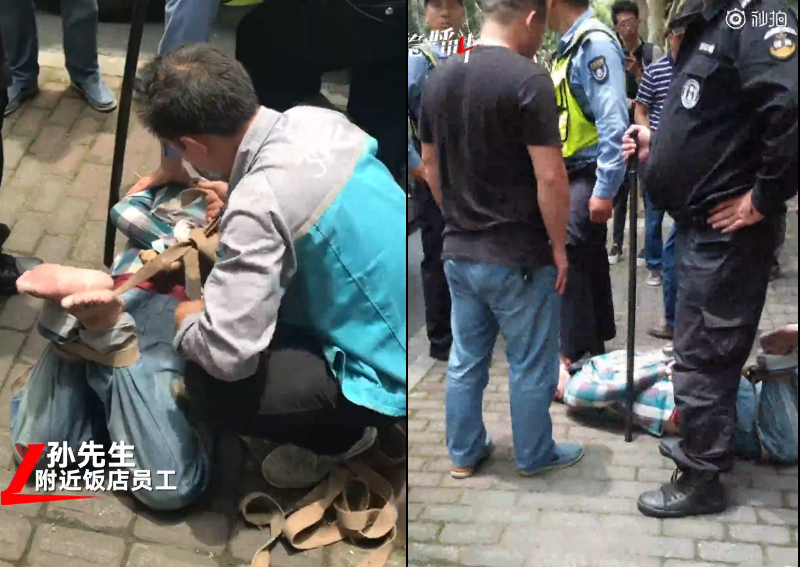 Huang Yichuan, 29, was taken into custody at the scene near a primary school in Xuhui district on Thursday where he allegedly attacked three children and a female parent. Police said Huang, who was born in Shaoyang, Hunan province, had been wandering to different cities to find work. He arrived in Shanghai in early June. Failing to find a job, Huang became anti-social and sought revenge on society, police said in a statement. On Thursday morning, Huang - in possession of a kitchen knife - took a bus to the vicinity of Shanghai World Foreign Language Primary School on Pubei Road. He then followed students leaving school and stabbed the boys around 11:30 am, the police said. He was quickly subdued by police officers and passers-by. The wounded boys were rushed to the hospital but died despite emergency treatment. The female parent and another boy suffered injuries that were not life-threatening, the police said. Videos of the crime scene shot by passers-by were circulated online. Rumours - that the killing was Huang's revenge against the school for taking his money while forcing his children to quit, or that he was a faculty member at the school and that more than two people died - also appeared online. Shanghai police identified the rumourmonger as a real estate agent surnamed Wu on Saturday. Wu was detained, while seven others who allegedly spread the rumours have been summoned by police. According to the police, Wu, 26, used social network WeChat to share real estate information. To draw more readers, he started rumours about the attack, which quickly spread to a large number of people. The rumours had a negative social impact, the police said. Wu's WeChat account has been shut down, Shanghai's cyberspace administration said on Saturday. Police warned that activities on the internet are not outside judicial reach, and anyone who fabricates or spreads rumours that mislead the public or cause panic may be tracked down and punished. Weng Tiehui, Shanghai's vice-mayor, visited the victims in the hospital as well as the bereaved families on Thursday and Friday, expressing her condolences on behalf of Shanghai Party chief Li Qiang and Mayor Ying Yong. "The whole society cares about you, and our hearts are with you," she told the victims' families. "We'll strengthen the security around schools for better protection of our children."